Kimmerer to Speak at U.N.
Dr. Robin Kimmerer of the ESF Department of Environmental and Forest Biology has been invited by the president of the United Nations General Assembly to give a presentation at the U.N. Monday, April 27. Kimmerer was invited to participate as a panelist at a plenary meeting to discuss how harmony with nature can help to conserve and sustainably use natural resources. The theme of the meeting is "Harmony with Nature: Towards achieving sustainable development goals including addressing climate change in the post-2015 Development Agenda." She will speak about the importance of a shift from the anthropocentric worldview to a biocentric worldview in support of global sustainability, informed in part by indigenous wisdom. Recent General Assembly resolutions have recognized the importance of harmony with nature to the advancement of sustainable development, and the concept has been incorporated into the U.N.'s proposed sustainable development goals. The discussion is intended to provide an opportunity for stakeholders to reflect on the relationship between humanity and nature, and examine ways in which harmony with nature can contribute to the achievement of sustainable development. The U.N. states, "Harmony with Nature is a principle to build a different and better world to live well in peace and balance with Nature acknowledging and respecting that there are different worldviews based on living well in harmony and balance with Mother Earth. Harmony with Nature calls for understanding that the strengthening of the ecosystems, biodiversity, and Nature's environmental functions will only be possible if all living beings live in complementarity with Mother Earth. " Kimmerer is a Distinguished Teaching Professor at ESF and the founding director of the ESF Center for Native Peoples and the Environment. The center's mission is to create programs that draw on the wisdom of both indigenous and scientific knowledge for the shared goal of sustainability. Her research interests include the role of traditional ecological knowledge in ecological restoration and building resilience for climate change. In collaboration with tribal partners, she and her students have an active research program in the ecology and restoration of plants of cultural significance to Native people. She is active in efforts to broaden access to environmental science training for Native students, and to introduce the benefits of traditional ecological knowledge to the scientific community in a way that respects and protects indigenous knowledge. Kimmerer is an enrolled member of the Citizen Potawatomi Nation. Her writings include "Gathering Moss" which incorporates both traditional indigenous knowledge and scientific perspectives. She was awarded the prestigious John Burroughs Medal for Nature Writing for that book. She is also the author of "Braiding Sweetgrass: Indigenous Wisdom, Scientific Knowledge and the Teachings of Plants" on the subject of living in reciprocity with land. "Braiding Sweetgrass" was honored with the Sigurd Olson Nature Writing Award. She won a second Burroughs award for an essay, "Council of the Pecans," that appeared in Orion magazine in 2013. 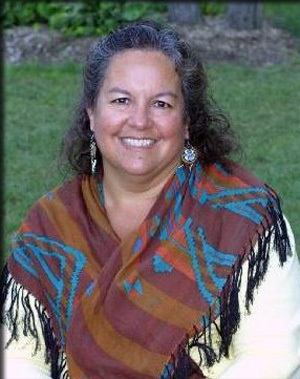 She has served as writer in residence at Andrews Experimental Forest, Blue Mountain Center, the Sitka Center and others. Her literary essays appear in Whole Terrain, Adirondack Life, Orion and several anthologies. She holds a Ph.D. in botany from the University of Wisconsin and is the author of numerous scientific papers on plant ecology, bryophyte ecology, traditional knowledge and restoration ecology. She is the co-founder and past president of the Traditional Ecological Knowledge section of the Ecological Society of America. Anyone interesting in watching a live webcast of the event can check the link above to see when the session is likely to shown.